Burr Ridge, IL – February 7, 2019 - Transient Specialists, a leader in EMC test equipment for over 30 years, announces that they will be the sole United States Distributor for both Teseq and EM Test electrostatic discharge generators. They offer quick delivery times and options for A2LA accredited calibrations upon request. With a large inventory of rental simulators, they provide an ideal solution when looking to test a simulator before purchase. Many of the simulators, including the NSG 435, NSG 437, and NSG 438 have the ability to test to a variety of standards and applications. These immunity test generators have the ability to test to 30 kV and offer a variety of networks. 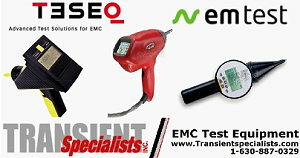 Transient Specialists, conveniently located in the mid-west, also offers a variety of EMC test equipment rentals to accommodate your testing needs. Our test equipment comes with all required cords and software for use. A2LA accredited calibrations for new purchases are available upon request. All of their automotive electrostatic discharge simulators come with A2LA calibrations. They also provide rentals of a variety of other EMC equipment. Simulators can be purchased with a variety of networks, ranging from the standard 150pF/330Ω to automotive networks 150 pF/2 kΩ and 330 pF/2 kΩ. Many of the networks can be purchased together as a package ensuring that all testing needs can be met. This is often done with automotive ESD testing as it requires multiple networks to meet testing requirements.